On June 27th, Queen Elizabeth II shook hands with former IRA leader, Martin McGuiness, now British Parliamentary MP for Mid Ulster. It was an event that many people who lived through the ‘Troubles’ in Ireland thought impossible. 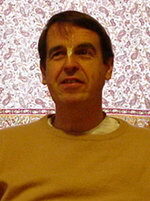 Senior Hare Krishna devotee Akhandadhi Das was invited to speak briefly on the topic as part of his regular ‘Thought for the Day,’ a morning radio piece that goes out to around 7 million thoughtful listeners on Britain’s BBC4. “Good morning. It’s an everyday act so habitual we rarely consider its meaning, but today, one brief handshake will carry enormous significance and symbolism. 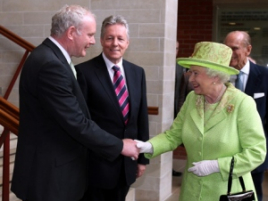 The Queen and Deputy First Minister, Martin McGuinness, will shake hands at a charity reception in Belfast. This meeting raises all sorts of conflicting issues and deep emotions for the people of Northern Ireland and beyond. It is precisely because it evokes decades, indeed centuries, of tragic history, of personal and collective hurt and loss, that so many of us are moved by the gesture and hopeful of the future it may contribute to. The Hindu epic, Mahabharat, recognises the difficult act of balancing justice and forgiveness. Does reconciliation imply condoning past actions? Does it deny consolation to victims by not bringing perpetrators to justice? One sage suggests that there are times for responding with strong action and there are times for forgiveness. Both may be justified in certain circumstances. But, it is knowing which to apply and when that brings peace and progress. There’s a feeling that the meeting of the Queen and Mr McGuinness could not have happened in days gone past. We weren’t ready for it perhaps – being still caught up in the politics and the experiences of the Troubles. This is natural, says the Mahabharat: because the tendency is to think that forceful response is real action by our leaders; it’s only later we see how such an approach may prolong, rather than curtail, continued violence. As it says: If the injured return their injuries, if the defamed return the words spoke against them, or the oppressed become the oppressor, what is the hope for future generations? It’s only if people can be as forgiving as Mother Earth, that there can be life, peace and prosperity. Returning regularly to my home town, I have seen how incredibly the province has moved on and this act of reconciliation represents the current mood of the majority. Even so, drawing a line with the past today is a brave and bold step by both the individuals and their communities. One Hindu saint commented: There’s just one fault in those who forgive, and that is that the foolish regard them as weak. But, ignore that – he said – forgiveness is actually a great power. It is the ornament of the strong.